If you live in America, you must know that football season is coming to an end on Super Bowl Sunday. People all over the country are throwing Super Bowl parties to celebrate. However, humans aren’t the only ones excited for the big game. Dogs are getting in on the action, too. Here are a few pups who couldn’t be more excited to get in the football spirit. This Pit Bull is ready to play, just as soon as he slides off his annoying helmet. He’s not big on the safety equipment, but he looks very cute in his Texans jersey and little game pants. But the main event is chasing the ball, just like in the real game. He grabs the tiny football and bolts for the end zone, which is his doggy bed. It’s a bold strategy, but it seems to pay off. Ivy looks pretty hilarious in that football player costume. She’s ready to take on Sookie in this dog vs. dog battle for–something. Although the two just seem to be more into a good roughhousing match than an actual game. Still, they’re pretty fun to watch. Speculation about who will win a football game can be wildly inaccurate. But it’s really a 50-50 shot when you think about it. So why not let puppies decide the outcome? It seems like the puppies couldn’t care less about the game, and maybe that’s why their prediction was a little off last yearr. However, they sure are happy to get a big bowl of chow, no matter what team name is on it. Georges the Golden Retriever loves his sports, and he’s really excited for football. He doesn’t care so much what’s on the other channels, but as soon as there’s a ball going down a field, Georges’s tail starts wagging, and he’s jumping for joy. The pup can barely contain his excitement. Nahla, the young Boxer-mix in this video, doesn’t need to watch a game to get excited for football. She’s just happy to do what she does best–tear the ball to oblivion. She couldn’t be more content, just sitting around gnawing away on her deflated ball. Nahla isn’t moving down the field, but she sure is cute. Jack the Black Labrador is in training for the big game. He’s got a pretty good defense, but he doesn’t have much weight to pull off the big tackles yet. The pup uses his speed best on offense, where he easily outruns the competition. He’s probably better at football than any dog–and most humans–that I’ve seen. 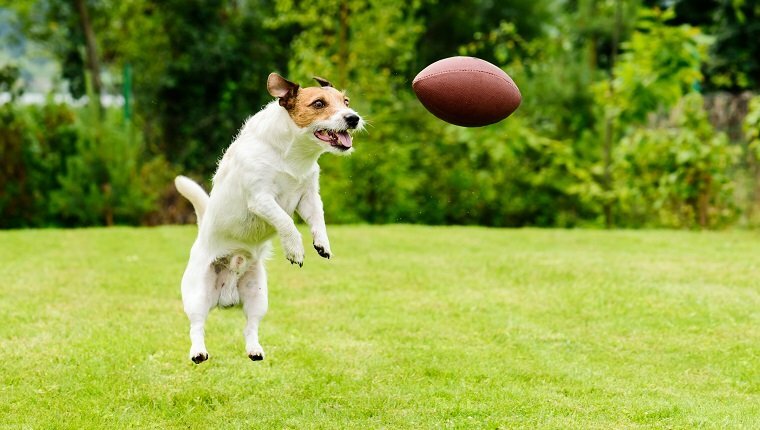 Is your pup excited for game day? Let us know in the comments below!